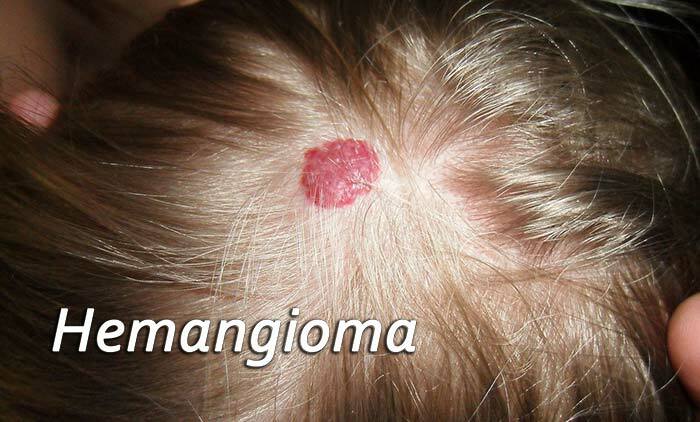 A hemangioma is a benign tumor composed of blood vessels. There are two main types of hemangiomas: infantile hemangiomas and cherry hemangiomas. Infantile hemangiomas, as the name implies, occur in infants. This is benign tumor is almost always harmless and resolves on its own without treatment. It appears as a small red growth that rapidly grows to about 3-5cm in diameter (rarely growing up to 20cm in diameter) before slowly resolving over a few years. Almost all infantile hemangiomas are completely resolved by age 7. The cause of infantile hemangiomas is unknown. Infantile hemangiomas can be very worrying to parents but treatment should be avoided unless the tumor interferes with the function of the eyes, nose, or mouth or becomes ulcerated or infected. If treatment is required, hemangiomas can be reduced with injectable, oral, and topical steroids, beta-blockers such as propranolol, and pulse-dye laser therapy. Surgical removal is rarely performed because it carries risks of hemorrhage. Cherry hemangiomas are small (less than 1 cm) red-to-purple growths that usually begin to appear in middle age – increasing in number with advancing age. It is unknown what causes them but no treatment is required for cherry hemangiomas as they are benign. However, these growths may be cosmetically concerning and bleed excessively when injured. Therefore, many people seek to have them removed, but it is important to note that all possible treatments carry the risk of scarring. Hemangiomas may be treated with electrocautery, intense pulsed light devices (IPL), pulse dye lasers, cryotherapy, and surgical removal, though treatment through surgery is rare because these lesions tend to bleed heavily during the procedure. If you quickly develop a large number of cherry hemangiomas it is important to consult your dermatologist as this can be a symptom of internal malignancy.